NEW YORK, New York, April 22, 2011 (ENS) – The all-electric, zero-emission Nissan LEAF won the 2011 World Car of the Year award Thursday at the New York International Auto Show, beating out the other two finalists – the Audi A8 and the BMW 5 Series. 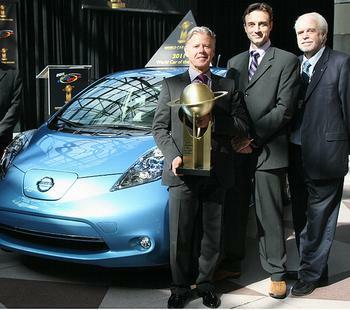 The LEAF is the first electric vehicle to win the award. “It is a great joy that the world’s first, mass-marketed electric vehicle, the Nissan LEAF, has won the prestigious award of 2011 World Car of the Year,” said Nissan Chairman and CEO Carlos Ghosn. The World Car of the Year award winners are selected and voted on by an international jury panel comprised of 66 top-level automotive journalists from 24 countries. Now in their seventh year, the annual World Car awards are intended to complement, not compete with, existing national and regional Car of the Year programs. The World Car of the Year awards are administered by a non-profit association. There is no affiliation with, nor are the awards in any way influenced by any publication, auto show, automaker, or other commercial enterprise. 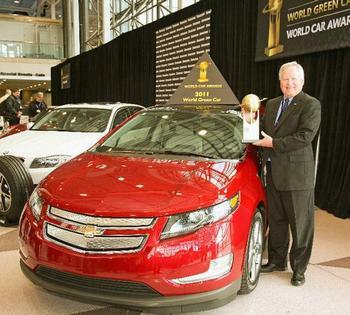 The other big award announced at the New York Auto Show – 2011 World Green Car of the Year – went to the 2011 Chevrolet Volt. The Volt was chosen for the final three from an initial entry list of 12 new vehicles from around the world. The two other finalists were the BMW 320d Efficient Dynamics Edition and the Nissan Leaf. The Chevrolet Volt will be eligible for the 2012 World Car Award as the extended-range hybrid goes on sale in Europe and Asia later this year. “The selection of the Volt as the World Green Car is a further proof point of the fuel-efficient technologies that are now being offered by the Chevrolet brand around the world,” said Rick Scheidt, vice president of Chevrolet marketing. Due to the complexity of some of the green technologies, three experts were appointed by the World Car Awards Steering Committee to extensively review all documentation and specs associated with each candidate. They were asked to create a short-list of finalists for review by the 66 jurors in their second round of voting in February. The ballots were tabulated by the international accounting firm KPMG. The three experts – Phil Berg, representing North America; Dean Slavnich, representing Europe; and Tadashi Tateuchi, representing Asia – were unanimous in choosing the Volt as a top three finalist. Nissan is going a step further in New York, revealing a racing version of the Leaf – the concept Nissan Leaf NISMO RC. “Combining the talents of NISMO, Nissan’s world renowned motorsports group, and engineers behind some of the company’s Super GT and FIA GT1 race teams, the Nissan LEAF NISMO RC will serve as a rolling laboratory for the accelerated development of EV and aerodynamic systems, as well as a platform for the development of new green motorsports series,” said Carlos Tavares, chairman of Nissan Americas, and the keynote speaker for the New York Auto Show. Aiming to be the world leader in zero-emission vehicles, Nissan, with its Alliance partner, Renault, has formed partnerships with more than 90 governments, cities and other organizations around the world to develop and produce EVs and lithium-ion batteries and also to promote sustainable mobility. The award-winning cars were announced at a press-only day at the New York Auto Show. The opening day ceremonies for the public will be held Saturday morning at the Javits Center. The show features an EV Pavilion where visitors can experience zero-emission vehicles for themselves.